Kiwanis Club of Carson Valley "Ham Bingo"
Name: Kiwanis Club of Carson Valley "Ham Bingo"
It's almost time again to empty your piggy bank! 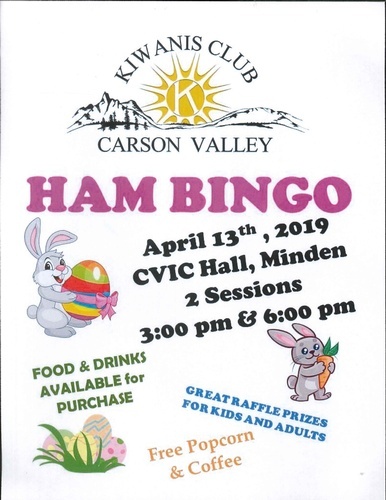 The Kiwanis Club of Carson Valley will be hosting its annual Ham Bingo on Saturday, April 13, 2019 at the C.V.I.C. Hall in Minden. There will be two sessions, the first is at 3 pm, the second is 6 pm. Bingo cards are 3 games for a $1.00 and there is no limit to the number of cards an individual may play. Games will last until all hams are given away and an exciting grand prize is awarded for each session. Tickets will be for sale at all sessions for raffle prizes. Free popcorn and coffee will be available; hot dogs, chips, water and soft drinks available for purchase. Members of the Kiwanis Club of Carson Valley provide the hams and the grand prizes. Raffle prizes are donated by community businesses. 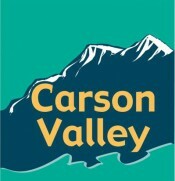 Proceeds from the event will be used to support organizations that focus on the children in Carson Valley. For further information, including how to become a member of Kiwanis, call Sally Grant 775-339-8882.